People commonly attribute the creation of wine to the Greek and Romans but the consumption of alcohol began more than 9,000 years ago in 7,000 BC as recorded in China. At the same time in the Middle East, archaeologists found records of grape wine being made. Classical Greek people drank wine during breakfast and symposiums (aka drinking parties). Other cultures discovered the process of creating wine later and incorporated it into daily meals or saved them for special occasions such as religious ceremonies or for health. In order to experience drinking wine like the ancient societies did, there’s no need to find a time machine. Just order wine online or buy from your local liquor store and follow the tips below for a blast into the past. The Ancient Chinese usually drank the rice wine warmed and flavored it with additives as a form of traditional Chinese medicine. Wine was also important in religious ceremonies or used during important life events. Other wines the Chinese favored were plum wines. Today, you can find rice wine at the liquor store or Asian markets, where you’ll find them in the cooking aisle. Order some of your local Chinese take-out and a bottle of warmed rice wine and get in touch with your spirituality. Dionysus, the god of the grape harvest and fertility, is associated with wine. He is also the patron god of the Greek stage. The consumption of wine in Greece was thought to bring an individual closer to the deities. Dionysus had followers called maenads, which he encouraged to stay away from the cities and live in the forest. 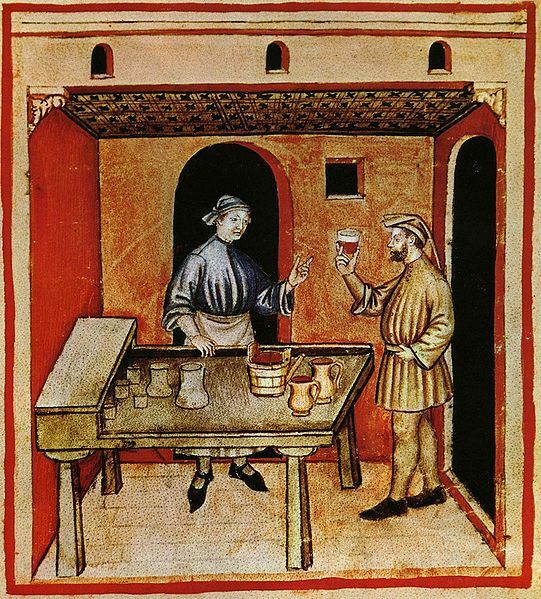 The Greeks drank warm or chilled wine and full strength or diluted. Bring out your inner Greek god or goddess by grabbing a bottle of sweet or dry wine, which the Ancient Greeks drank and your camping gear and head to a forest for the weekend. A few wines worth trying are a Cabernet Sauvignon and Cabernet Franc, which contains a black grape called limnio that the Greeks cultivated. Bonus points if you bring an amphora to drink your wine out of. The Roman form of Dionysus is Bacchus and you’d wonder how both societies made such great advances in society and culture with all the drinking happening. As much as they did drink, both the Romans and Greek drank diluted wine—1 part water to 1 part wine or 1 part wine to 4 parts water. At its height, each Roman citizen consumed about a bottle of wine each day. Romans and the ancient world valued sweet white wines. Other wines they drank were spiced and similar to today’s mulled wine and vermouth. The increase in drinking is a result of switching their diets in the 2nd century BC from moist porridges to dry breads. Grab a few friends, a bottle of sweet white wine, red wine, mulled wine, berries, grapes, cheeses, and breads to enjoy a taste of everyday Roman life. Veni, vidi, vici! Alcohol has been in Egyptian history since the earliest records and Osiris was worshipped across the country because he is credited with inventing beer. Beer and wine were commonplace in Ancient Egyptian society with at least 24 varieties of wine available. Similar to other cultures, wine was used for celebrations, in religious ceremonies, to relax, for health, and for medicinal purposes. The grape vines were attached to trees like the elm and some had monkeys and baboons help to harvest the grapes and other fruits. Owning a vineyard was very prestigious and made for the elite and royalty. Take a trip to your local vineyard and spend the day imagining what it would be like to be among the royalty while sipping on various wines and enjoying figs, dates, and pomegranates. Throughout the ancient world to today, a few things are still true: we drink wine to celebrate, we use wine for special occasions, some use wine in religious events, we share wine with our guests, and toast to our health with a helping of antioxidants. In our love of food and wine, it was only natural that we pair them together for an extra delicious experience too. Many would probably agree that wine makes life a little more fine. This is a guest blog by Erin Tran, a writer for LiquorMart.com. If you liked this piece, then follow me on Twitter @CustParadigm. When I’m not writing about wine or history, I’m usually looking for the next wine festivals and brushing up on my knowledge of ancient cultures.